we are "wasabi experience project"
Engage in an hour of creative and relaxing activity in Jiyugaoka, one of the most fashionable neighborhoods in Tokyo. Herbariums are blooming flowers preserved in glass jars or bottles which have recently become increasingly popular among Japanese women as interior accessories. 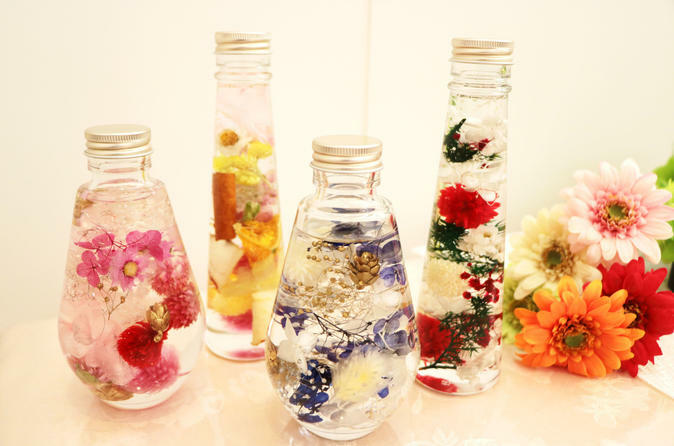 Choose your favorite flowers and arrange them as you please to create a couple of your own original herbarium bottles that will add color to your space. An option to add scents to them is also available at extra cost.